New vulnerability assessments for 41 species and 3 habitats in the Appalachians are now available. The conservation community can view and search each of these assessments by relative raking or vulnerability scores, conservation status ranks, state and subregion of assessment, and higher taxonomy. In addition, principle investigators NaturServe compiled the results of 700 species assessments previously completed by other researchers as well as assessments on several habitats. The Appalachian LCC provided a grant to NatureServe to conduct critical vulnerability assessments. Researchers first convened a panel of experts to compile and review existing vulnerability assessments, compare strengths and weaknesses of methodologies used, and recommend a vulnerability assessment method for adoption. The recommended method was then deployed to generate vulnerability assessments for a suite of key species and habitats selected in consultation with partners of the Cooperative. The completed assessments are now on the Web Portal, where users can view and search by vulnerability scores, conservation status ranks, state and subregion of assessment, and higher taxonomy. In the presentations below, Dr. Lesley Sneddon of NatureServe gives an in-depth overview of this research. The bulk of the presentations provide viewers with step by step instructions on how to access, utilize, and interpret the many vulnerability assessments for species and habitats - both previous assessments that were assembled by the research team and new assessments that were developed for this project. In 2012, the LCC tasked NatureServe with a two-phase project that provided the LCC with: guidance on the most appropriate climate change vulnerability approaches; compilation of the existing assessments, of which there are many; and conducting new assessments where they're needed. The first order of business was to assemble a panel of experts to provide guidance on selecting the approaches, identifying the appropriate climate data, and providing criteria to help select species and habitats that need to be assessed. The panel convened a two-day working session at NatureServe's Arlington office to discuss this and document their findings and the recommendations. 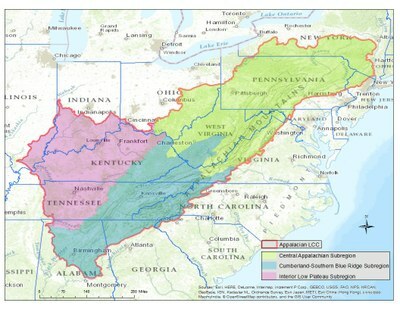 You can find the result of their work in the PDF document titled Understanding Land Use and Climate Change in the Appalachian Landscape: Phase I.